We felt the need to stretch our legs so walked the rail trail, north from Waterville. The afternoon was accompanied by a few broken clouds and the waning sunlight was sufficient to illuminate a number of Sycamores which formed a promenade along a low point in the riparian slope. 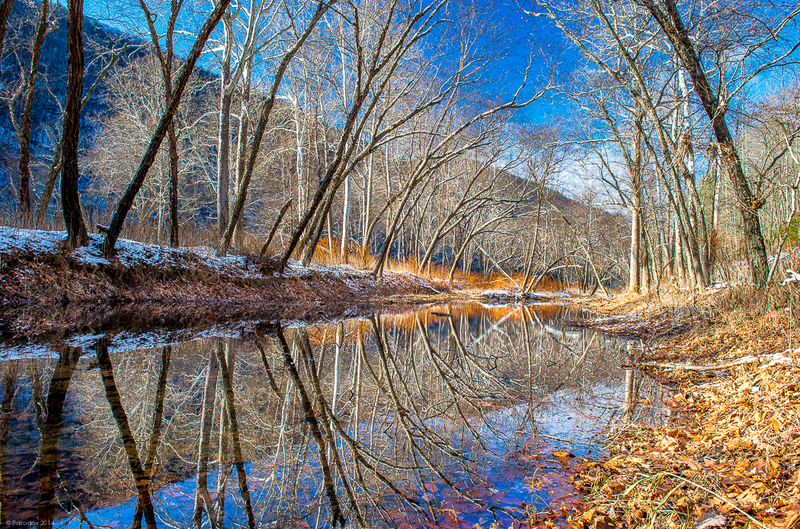 Water reflected a number of trunks such that they, along with their seconds, formed something of a tunnel leading toward the Pine Creek Gorge. As I look at this image I get a real sense of movement. Of circles. And, given the time of year, perhaps that is appropriate. Though the Solstice is upon us, I will not discuss the tilt of the earth, the cycles of the seasons, or cycles of birth and death. How about my old hobby-horse which argues, Life is an Oscillator? I don’t know whether the saying is unique to me but I do know that the adage is universally experienced if not universally stated using just these words. I have always observed that one would be seriously mistaken to assume that our lives should mirror those of characters depicted in the movies. Have you ever noticed that those folks never go shopping, never have the need for a plumber’s helper, and never get flat tires or splinters? Life in the movies is replete with luxury cars, paid rent, beautiful teeth, and deep pockets. The real lives of real people aren’t anything like that for real life includes, for many of us, cars in need of repair, overdue rent, root canals, and maxed-out credit cards. Real life, as it is experienced by most of us has ups and downs. The ups are wonderful, to be sure. The fact which is lost to most folks however, is that the downs are every bit as expected. And here is where one of many problems with pop culture may lie. Most think that negative oscillations are not right, abnormal, or otherwise indicative of the fact that you’ve not tried hard enough or have done something wrong. Surely, no one likes the negative oscillations of life but, I repeat, they should be every bit as expected as the much-anticipated positive ones. And, perhaps, overcoming negative oscillations is the only way to experience the good life, in its best sense. I think it is fair to hope that in the long haul, and on all time scales, our lives will be a break-even proposition or, in the best of lucky circumstances, slightly above that axis defined by Positive – Negative = 0. Maintaining or even exceeding that breakeven, over extended periods, is difficult work but those in possession of personalities which are capable of turning negatives into positives are that much more likely to reach that upper, right-hand, quadrant.